16 October 1834, painted 1835. 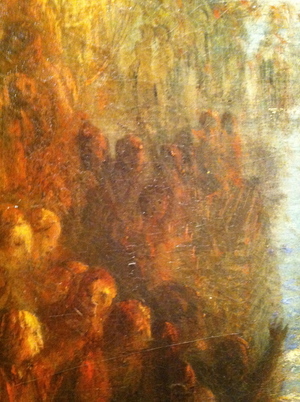 In Cleveland for the holidays, M. and I walked through the galleries of the art museum, and stumbled upon Turner’s The Burning of the Houses of Lords and Commons, 16 October, 1834. If I’d seen it before, I’d entirely forgotten. A painting of great power and intricacy. 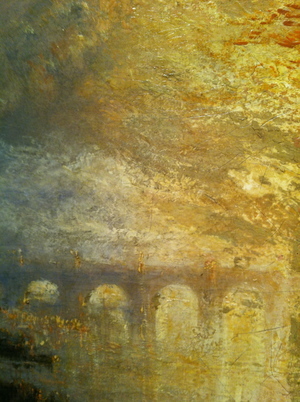 Turner one of those rare colorists who seems, to me, to have control within the color – especially here of red that really burns at the heart of the painting and of the expanding cloud of yellow and white. The color has shape and density, symmetry and modulation. 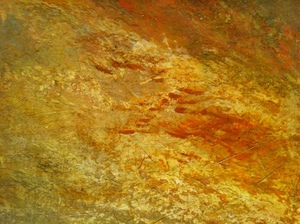 It is not so much that the painting seems to have a geometry as that the color, within itself, does. 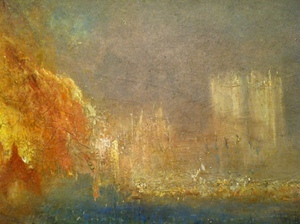 Monet knew Turner’s paintings and his admiration for them was part of his decision to go to London to do his three late series. One would like to be sure that he had had adequate time with this particular picture, which seems to have a project related in an important way to his own. Monet set the Houses of Parliament, the Thames before them, and the air above them in such a way that each could be transmuted into the others. 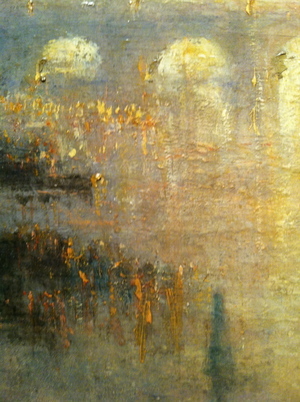 Turner and those with him along the banks of the Thames that night saw this happen. 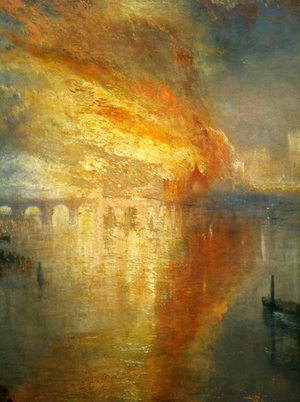 The night of the great fire, October 16, 1834, Turner worked all night, up and down the banks of the Thames sketching rapidly in watercolor, which was his habit. One of these sketches is reproduced in a beautiful called Turner: Les Carnets de Dessins with text by William Gaunt. 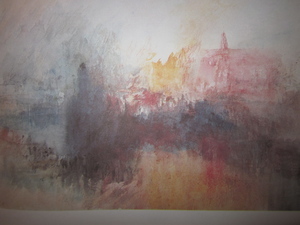 Turner’s watercolors, the most wonderful I have ever seen, were his private work, and were not brought before the public until well into the 20th century. Thus Monet, hurrying up and down the sides of the Thames desperate to catch his evanescent effects, never knew how close a ghostly colleague he had.